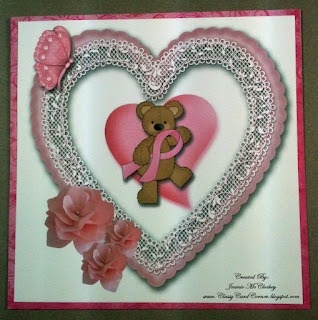 Hi again, I am here to post another card for Link Up for Pink Breast Cancer Aware linking party. Well, today I decided I would try something new that I have never done before, I made a totally digital card. Let me show you a really beautiful card and then I'll tell you my story of how I came to do this. Okay, here goes. Gosh, there is just so much you can do with the digital designs. This particular Digital Designer Pack came from "Touched By a Butterfly" and I used several BCA packs to achieve the look I wanted. The Pink Lace Heart and Flowers came from FBD Series BCA and the Bear and Butterfly came from Hope BCA Kit. It was amazing how easy, with the help of my daughter of course, to make this card, she is really a photo shop guru. She stood over my shoulder and explained how to click here and click there to get certain things. It was fun and once I got the hang of it I am sure I will do more using this technique as I sit and create. Celeste of Touched By a Butterfly is one of our very generous sponsors donating (5) $30.00 vouchers to five lucky winners. That's an awesome prize. 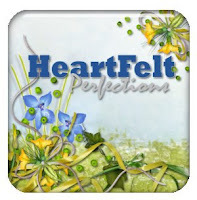 I am so excited to announce I am now selling my kits at Heartfelt Perfections. I am so honored and excited to be a part of this wonderful store. I am currently uploading kits there now. All of my products will be 20% off this month. Congratulations, Celeste on your new journey. I wish you the best. to see the gorgeous creations being submitted to win the fabulous prizes that have been donated for the Linking Party. On the link it will show you all of our fabulous supporting sponsors and the generous prizes donated that's over $4,000. Woohooo!!! Joanie, you are rocking the digital designs!! It turned out fantabulous!!! Super adorable! Love the cute bear!! Wow! You totally knocked this out of the park - it's amazing! OH WOWZERS!!! This card is FABULOUS!!! I love it... I love it all. Thank you so much for the wonderful shout out about my store and new adventure. Thank you so much for the wonderful support. Love your digital card Joanie!!! 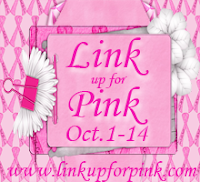 Thank you for your participation in our 2nd Annual Link Up for Pink! Your entry #132 won a stamp set from Cardz TV stamps. Thank you for helping us spread awareness.